Over 14 days, discover the best of Kenya. View Mount Kilimanjaro, see herds of elephants at Amboseli National Reserve on your game drive & visit Masai Mara. Kenya is a land where open savannah gives way to deep valleys and magnificent mountain ranges. Straddling Africa’s impressive Rift Valley, right on the equator, the weather tends to be ideal one day, and perfect the next. 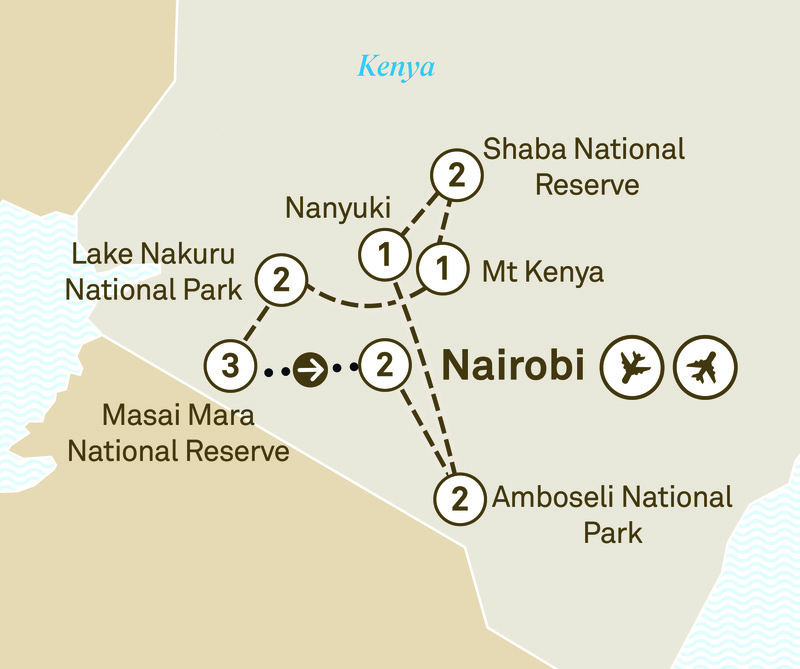 This 14 day sojourn starts in Nairobi, then continues to Amboseli National Park for views of Mount Kilimanjaro, followed by Mount Kenya. Travel on to Lake Nakuru and the Masai Mara Reserve and encounter some of its distinctive indigenous Maasai culture, and take unforgettable forays into its magnificent wilderness. Along the way, you’ll get to experience the finest game lodges anywhere in Africa. Welcome to Kenya and its vibrant capital Nairobi. On arrival you’ll be transferred to your opulent hotel, situated on a private acreage, for your two night stay. Start your day with a giraffe encounter and learn about these endangered animals. Relive the romance of the movie Out of Africa during a visit to Karen Blixen’s home before travelling to Kiambethu Tea Farm. Wander through the tea fields and hear the stories of the first commercially grown tea in Kenya. Choose to dine at Carnivores restaurant, famous for a wide variety of meat choices that are all roasted on a traditional Maasai sword over a fire pit. Or, enjoy dinner at Café Maghreb in the hotel. Mount Kilimanjaro, the highest freestanding mountain in the world, commands the horizon as you approach Amboseli National Reserve. Massive herds of elephants migrate across dry plains, linking swamps with open pastures. On your game drives today and tomorrow, cheetahs and prides of lions can often be seen stalking the plains. Your lodge, your home for two nights, is situated beside a major elephant trail with views of the mountain. Go in search of wildlife on morning and afternoon game drives. Climb to the top of Observation Hill and gaze at the sunset views over Amboseli National Reserve, drink in hand. Journey north to Ol Petaja Conservancy. Tonight you’ll stay at Sweetwaters Tented Safari Camp, situated right next to a waterhole. Visit a sanctuary for endangered chimpanzees, then take in magical views of Mount Kenya as you continue north to the Samburu ecosystem in central Kenya, home to a variety of wildlife not found anywhere else. You’ll get to enjoy a two night stay at your lodge, which straddles the river that waters the adjacent reserves. Today, marvel at the diverse range of wildlife, including the Reticulated giraffe, the tree climbing gerenuk, Grant’s gazelle and the rare Grevy’s zebra, along with a multitude of other big game. Arrive at Mount Kenya for your wonderful Special Stay and spend the afternoon relaxing at this charming property. The shallow alkaline lake near the town of Nakuru is home to flamingos, pelicans and other birds. Enjoy a two night stay at your lodge overlooking the lake. Take game drives in search for black and white rhino, giraffe and many more. Visit Lake Nakuru Baby Orphanage Centre, established by an Australian family and enjoy lunch with the children. The Masai Mara is home to 95 species of animals and over 400 species of birds. The annual Great Migration from July to September attracts over a million wildebeest, zebra and impala, a phenomenon that has to be seen to be appreciated. Spend three nights at your camp inside the reserve. Game drives through the Masai Mara encompass all types of animals, from lion, cheetah and leopard, to vast herds of antelope and zebra. During migration season you get the chance to see the crossings at Mara River, renowned for its crocodiles. their close association with the wild animals. Hot air balloon flight - Experience the savannah at dawn from a hot air balloon. Enquire for details – additional expense, please book on tour. Join your Maasai guide for a walking safari or take an African cooking class. Enjoy an exclusive farewell bush breakfast on the open plains of the Masai Mara, right amongst the wildlife. Board your light aircraft for a scenic flight over the reserve to Nairobi, then connect to your international flight. Please book flight to depart after 4pm.